Sikkim Manipal Institute of Medical Sciences invites candidates who had applied to SMIMS and whose ranks are given below for the first round of counselling. Candidates attending should satisfy the eligibility requirement as per the NEET Information Brochure 2017 and the minimum eligibility requirements as prescribed by the Medical Council of India for admission to MBBS course. Sikkim Manipal Institute of Medical Science follows Common Counselling for MBBS 2017 and the counselling is conducted under the overall superintendence, direction and control of the State Government of Sikkim, Department of HRDD. 18. Five current passport size photograph. 19. AIU Equivalence Certificate for candidates with school level qualification from schools affiliated to Foreign Board. There will be active verification of the NEET All India Rank submitted by the candidate with the information available in the NEET website. Candidate whose NEET All India Rank does not match with the information with the NEET website will be disqualified for the counselling process. Wards of serving defence personnel are eligible to be considered under the category provided, parent(s) of the candidate who is a defence personnel must be borne on strength of a military unit located in Sikkim as on 01/01/2017. Admissions are made on the basis of merit obtained in National Eligibility Entrance Test (NEET) conducted by CBSE. 1. Certificate from Commandant / Commanding Officer / Adjutant of their respective units. 2. Copy of posting order to Sikkim. Candidates will be called as per their NEET All India Rank 2017 for document verification. Successful candidates will be allotted seats according to their rank and number of seats available. Such candidates should submit their original documents and pay the first year fees at the counselling. Sikkim Manipal Institute of Medical Sciences will not entertain any requests for extension in this regard. PAYMENT OF THE FIRST YEAR FEES IS MANDATORY FOR CONFIRMATION OF ADMISSION. 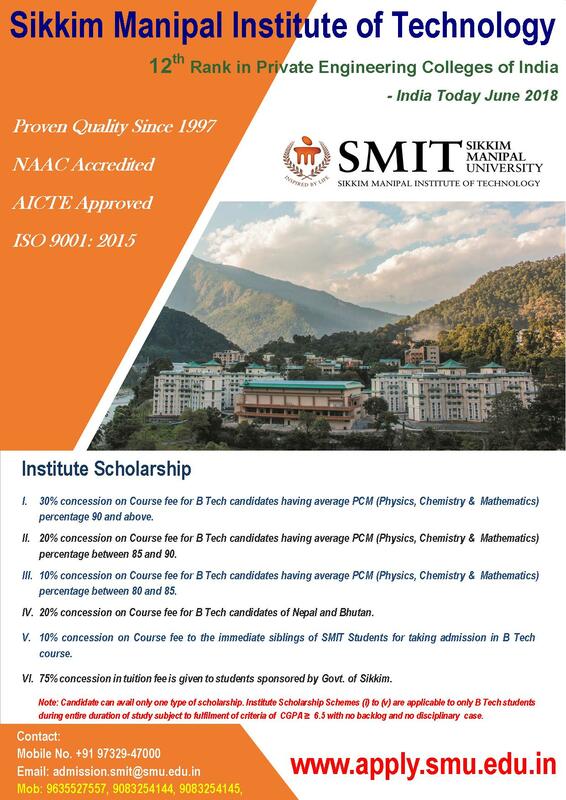 The first year course fees and registration fees should be paid by demand draft drawn in favour of ‘Sikkim Manipal University’ payable at ‘Gangtok’. (The payment to be made only through Demand Draft. Request for payment course fee by Cash,, RTGS,NEFT, Multicity cheques will not be entertained under any circumstances). 1. Copy of Passport/Residence Certificate of Sponsor. 3. Demand Draft of USD 500 (INR 32,500/-) as registration fee (Non Refundable). 4. Hostel fee of INR 1,02,000/- Both registration & hostel fee can be combined in one single draft of INR 1,34,500 /- in favour of ’Sikkim Manipal University’, payable at ‘Gangtok’. 2nd Instalment to be paid before due date 31st January 2018. Note: Caution Deposit of INR 10,000/- is required to be deposited at the time of admission. The number of candidates included in the merit list and also those called for the counselling will be more than the total number of seats available in the colleges. This is to take care of any dropouts at the counselling stage. Mere inclusion in the merit list and call for counselling does not guarantee admission to a course. This will exclusively depend on the candidates 2017 NEET All India Rank, the number of candidates attending the counselling & number of seats available. I _________________________ Sikkim Manipal University application no. _____________ having NEET All India Rank________________ son / daughter of____________________ being unable to attend the counselling for admission to MBBS course 2017 at Sikkim Manipal Institute of Medical Sciences Gangtok, hereby authorize ____________________ son/daughter of ___________________ whose photograph is affixed below and who will sign as shown below to represent me at the counselling. I ________________________________ a resident of______________________ hereby sponsor________________________ who is my ___________________. I also undertake to bear the cost of total tuition fees of the candidate for the entire course. A photocopy of my proof of passport is also enclosed.